Two children of a Parsi woman and her Catholic husband were initiated into the Zoroastrian community on Friday under police security as the Parsi community had objected to the Navjyot Ceremony. Police protection was provided after the couple, Roshni Mallu and Savio D’souza, approached Home Minister R.R. Patil through the organisation Association for Revival of Zoroastrian. 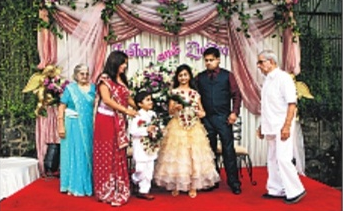 The ceremony was held in a hall at Bandra (West). Some members of the Bombay Parsi Panchayat had raised objection after they saw invitations for the initiation ceremony of Zinatra (10) and Tushar (7) being distributed. They objected because Mallu had married outside their community and according to them she was no more a Parsi and hence could not perform Navjyot. “They had approached the police fearing the ceremony would create a law and order problem,” said Vispy Wadia, a trustee of the organisation, which supported the couple. “Why should somebody object to it when a Catholic father is willing to get his children initiated into the Parsi community?” questioned Wadia.